Astrology.Care - What is a Rising Sign? Have you ever wondered what a Rising Sign is? It is often called Ascendant. 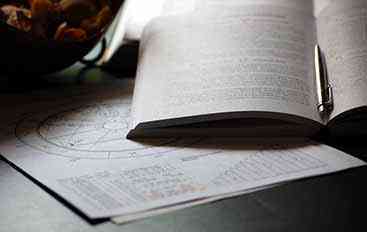 It may be in the natal chart on the place of the first House cusp. By the time of your birth this sign had been on the eastern point of the horizon. Ascendant changes degrees every 2-3 minutes and rises on the same path as the Sun does. That is why it is very important to know the exact time and place coordinates of birth for a real, professional horoscope. Ascendant may be different for twins born in 3 minutes difference, and it would be another horoscope. Ascendant location is the starting point for calculation of other house peaks. Difference in few minutes makes huge difference for the whole chart. 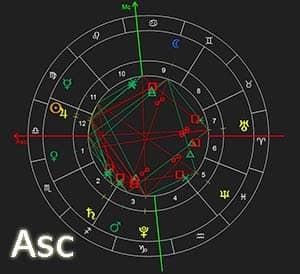 Ascendant is a real connection between our planet and zodiac sign that is over our planet at the moment of someone's birth. It is a crossing point between the personal houses and Zodiac signs. It shows the way the world see us, the way we let others perceive us, the image we have, how we promise and how we do, and what we can leave after all. Ascendant is a mask that we wear in order to be accepted in the society, it is our image and reputation. It shows how people see us and their opinion about us when they meet us for the first time. However, don't think Rising sign to be false, though it describes our mask, it is still part of us, the part that we create. It is not a lie, it is an image hat just doesn't show the full spectrum of who we are, only a superficial one. This image you show is still true, because you've created it and you live with it, so it is a real part of you, but Ascendant shows what impression you make on others with your image. It shows what others see in you, you can find a lot about yourself, analyzing the impression left after you. You can agree or disagree, but learn a lesson of how you look in other's eyes. Your Zodiac sign can be compared to your body that is not fully seen through layers of stylish and colorful clothing. The Ascendant is the way people see us, our clothing following abovementioned metaphor. It is a way of our behavior in order to get what our Zodiac sign wants. For instance a Capricorn individual is determined, enduring, and prefers being organized. In pair with Ascendant in Sagittarius, this individual will be frivolous, impassive, though will try to reach the same aims that Capricorn has. We are apt to be like our Ascendants when we are in unknown surroundings or around people we see for the first time. Also it works on business meetings, job interviews, dates etc. It is still a part of our personality. It is our style, which doesn't show our real feelings or desires. Rising sign can be a good method to analyze and explain why people behave this way, and why they've chosen this type of behavior. Ascendant also gives a description of how we look, of our preferences in lifestyle and clothing. Often, Libra-Ascendant person is attractive, Pisces-Ascendant is tender and visionary and has small feet, Taurus-Ascendant is thickset with strong neck etc. Ascendant characteristics are detail-oriented and true most of the time. You can make sure of it. Ascendant has a very important meaning in the natal chart. The planet that governs Ascendant is the one that governs the entire chart. To make it clearer, it means that every planet and every sign in your chart goes through the prism of your Ascendant or through its governing planet. It is the main reason, why so many people see a particular Zodiac sign representatives who act differently though are of the same sign. Apparently, they have different Rising signs. What's more, people with similar Ascendants can be quite different in life, because Ascendant is still not so important as the Zodiac sign. Ascendant only corrects and transforms the characteristics of people provided by the Zodiac sign, giving them different aspects and influences. In order to have a full picture o Ascendant influence on the particular sign, we will have to look through the energies of the planets in a certain aspect to Ascendant. Let's take a Leo-Ascendant person with Saturn in conjunction, in this case Saturn will influence the impact of the Ascendant making it not so bold and aggressive, so person will be less expressive as a result, than a usual Leo-Ascendant person.